Emergency workers lift a fragment of a plane outside the southern Russian city of Sochi on Monday. All 84 passengers and eight crew members on the Russian military's Tu-154 plane were killed when it crashed shortly after taking off on Christmas Day. Emergency workers lift a fragment of a plane outside the southern Russian city of Sochi on Monday. 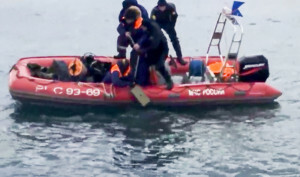 All 84 passengers and eight crew members on the Russian military’s Tu-154 plane were killed when it crashed shortly after taking off on Christmas Day.